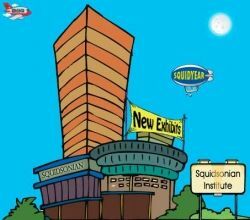 Situated amongst the populace of downtown Squidville, the Squidsonian houses a vast complex of museums and galleries. They feature the works of prominent Squid Artists, and showcase valuable relics and discoveries from ancient times. It's always interesting and educational, plus you never know what you may find on exhibit here! Be sure to pick up your lifetime membership card on the way out. This way you can return to see the new exhibits as they arrive! Looks like you're in luck, as they have free admission today! Just follow the arrows into the museum, and your educational experience will begin right away. The next group is ready to begin the tour, so step right up and follow along. Your guide will be sure you see the highlights...and perhaps some of the low ones too! Once upon a time, these parts were occupied by Cavesquid (Homus Squipiens). Here, a large wall mural depicts the clubbing lifestyle in prehistoric ages. The Squidsonian is proud to be home to Squidville's most famous works of art and sculptures. Amongst other treasures, is the world famous Venus de Squidoo! Squarcheologists (old Hippie Squids that just dig Squidville!) have uncovered a variety of artifacts showing a rich history. It is widely believed that Squidville's ancestors emigrated from Newbie Scotia. One of the most popular displays at the Squidsonian, is the Notorious Sqope Diamond. While all of the women yearn to own it, The Sqope Diamond does come with a curse....Mr Sqope! The Squidsonian is proud to offer a Planetarium where inquisitive squids can study the galaxy...particularly in search of the elusive "Purple Star". The Squidsonian is fully staffed with some of the brightest minds available. The Squeeks are always on hand to keep track of technological and scientific advances. The Squidsonian boasts having an enormous collection of the world's greatest art. Featured throughout the gallery is some of the finest original inks on canvas! Perhaps one of the more popular works of art is the infamous "Still Life" by famed artist Squidcent Van Gogh. and a disappointing leap for squidkind! The end of an era has come to Squidville with the recent closing of NASA (National Aeronautical Squid Association) leaving a sad feeling for many Squidizens. The Squidsonian is pleased though to be able to put on display, the last shuttle to go into space....Squidlantis. On your way out, be sure to stop and apply for a lifetime membership to The Squidsonian Institute. It will entitle you to return at any time for free admittance to see new exhibits. The staff and management hopes you enjoyed the tour, and if you did they would appreciate a "thumbs up" on their evaluation card. Don't forget to sign the guestbook and let us know you were here! Squidsonian by Steve Thompson / tagsforkids is licensed under a Creative Commons Attribution-Noncommercial-No Derivative Works 3.0 United States License. Squidoo logo is a trademark of Squidoo LLC. Graphics, Squidart and Squidoodles Â© 2009 by tagsforkids (Steve Thompson) . Some rights reserved. This work is licensed under a Creative Commons Attribution-Noncommercial 3.0 License. You may use these Squidoodle images for lenses, but not for commercial use (i.e. you can not sell them or use for advertising products), as long as you include credit and a link back to the Squidsonian Institute lens. Please note that I am not affiliated with, nor endorsed by Squidoo LLC. Thank you. How was your visit to the Institute? - Please let us know you were here. My tour through the Squisonian was both enchanting and hilarious. I made sure to apply for my important Lifetime Membership before leaving, as I know I will want to return many times! Another hilarious and brilliant contribution to your Squidart collection. Pinned to my board "Just for Squids" and social bookmarked. Funny, I felt like I had to be just a little bit quite here as I walked through the Squidsonian Institute....I smiled loud though! What a clever and creative lens! I smiled all the way through! Way to go Steve AKA tagsforkids on this squidsonian. You ROCK! A fun lens. You are quite creative. Enjoyed it. This is so imaginative and fun! I loved the illusive purple star! You are very creative! This is an adorable lens, and was such a fun visit! Your imagination is "all systems go," with this one. Thanks for sharing. The coolest Institute I've visited in a long while! My oh my, who wouldn't want to visit this splendid museum?! :) So cute! Another cracker - I'm going to make that my default comment for your Squid art lenses! Great artwork, I love the Cavesquids! (love all of them). Brilliantly funny artwork as always, you are truly talented. I was going to recommend this lens for a Purple Star, but I see someone beat me to it. Nicely done, blessed. @Mermaiden: Thank you! I do indeed have an absolute blast creating all of these. I'm glad you enjoyed. oh I just loved this. it definitely brought a smile to my morning. I bet you had a blast making them. Great lens! Very talented and cleverly put together. What a fabulous museum visit! And so much more fascinating than the previous IRL museums I've visited lately...seriously! You must have put so much work into this lens! Blessed by an angel! I just love the squidsonian! I was illuminated and delighted by the fine art on display at the Squidsonian! My dear, delightful as always ... am I would use a special word that Kim has used ... "brilliant!" I love your imagination and your adorable contributions. Say, who is that in the lower right of "The Squidsonian Squeek Squad" zooming around? Hugs my dear! Brilliant ... you continue to amaze me with your creativity and generosity! fantastic. i admire your creativity. I enjoyed it all thanks! I seen a purple star in one Exhibit. Thanks!